Fidel Castro led the Cuban Revolution overthrowing Cuban President Batista in 1959. He then took control of Cuba installing a communist Marxist government. He was the absolute ruler of Cuba from 1959 until 2008 when he became ill.
Where did Fidel grow up? Fidel was born on his father's farm in Cuba on August 13, 1926. He was born out of wedlock and his father, Angel Castro, did not officially claim him as his son. While growing up he went by the name of Fidel Ruz. Later, his father would marry his mother and Fidel would change his last name to Castro. Fidel attended Jesuit boarding schools. He was smart, but wasn't a great student. He did excel in sports, however, especially baseball. In 1945 Fidel entered law school at the University of Havana. It was here that he became involved in politics and protesting against the current government. He thought the government was corrupt and there was too much involvement from the United States. In 1952 Castro ran for a seat at Cuba's House of Representatives. However, that year General Fulgencio Batista overthrew the existing government and cancelled the elections. Castro began to organize a revolution. Fidel and his brother, Raul, tried to take over the government, but were captured and sent to prison. He was released two years later. Castro did not give up, however. He went to Mexico and planned his next revolution. There he met Che Guevara who would become an important leader in his revolution. 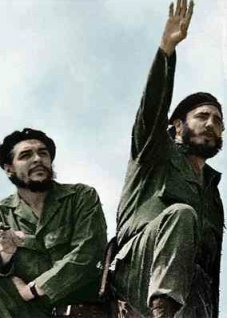 Castro and Guevara returned with a small army to Cuba on December 2, 1956. They were quickly defeated again by Batista's army. However, this time Castro, Guevara, and Raul escaped into the hills. They began a guerrilla war against Batista. Over time they gathered many supporters and eventually overthrew Batista's government on January 1, 1959. In July of 1959 Castro took over as leader of Cuba. He would rule for nearly 50 years. Castro had become a follower of Marxism and he used this philosophy in creating a new government for Cuba. The government took over much of the industry. They also took control of many businesses and farms owned by Americans. Freedom of speech and of the press was also severely limited. Opposition to his rule was generally met with imprisonment and even execution. Many people fled the country. The United States tried several times to remove Castro from power. This included the Bay of Pigs invasion in 1961 ordered by President John F. Kennedy. In this invasion, around 1,500 Cuban exiles trained by the CIA attacked Cuba. The invasion was a disaster with the majority of the invaders captured or killed. After the Bay of Pigs, Castro allied his government with the Soviet Union. He allowed the Soviet Union to place nuclear missiles in Cuba that could strike the United States. After a tense stand-off between the United States and the Soviet Union that nearly started World War III, the missiles were removed. Castro's health began to fail in 2006. On February 24, 2008 he handed the presidency of Cuba over to his brother Raul. He is known for his long beard. He almost always appears in public in green military fatigues. Hundreds of thousands of Cubans have fled under Castro's government. Many of them live in Florida. Castro's Cuba relied heavily on aide from the Soviet Union. When the Soviet Union collapsed in 1991, the country suffered as it tried to survive on its own. He was seen for years smoking cigars, but he quit in 1985 for health reasons. He is famous for his long speeches. He once gave a speech that lasted for over 7 hours!